The Christchurch earthquakes presented architects and urban planners with a unique opportunity. With so much of our CBD gone, they have been tasked with reimagining what a city center should look like. Fortunately the architectural style currently in vogue is likely to stand the test of time. Honest materials like natural concrete, steel and copper combined with lots of glass and strong linier lines created by louvers and shutters should remain fairly timeless. Christchurch’s need for talented architects and planners is obvious and thankfully in this, we are well catered for. However following on their heels is another layer of design and planning. It’s not nearly so conspectus or glamorous, and often we only notice it in its absence. The concerning thing is that it is often distinctly…. Unpleasant. This design trend is hidden in objects you pass by and use almost every day, objects that are themselves almost too banal to notice, and yet those objects may have been manipulating your actions and conforming your behavior without you even noticing it. A bench placed in a shady spot with a nice view. Rubbish bins conveniently located for office workers while they have their lunch. Other public amenities such as public toilets and bus shelters. These products are so commonplace that we give them barely a second thought. Yet these benches, bins, toilets and bus shelters are not as innocent as they appear – they frequently feature what is known as hostile architecture or simply unpleasant design 1. Often these ubiquities features of urban landscapes are designed to force us to interact with them in a prescribed way, a way that is rarely user-centric. 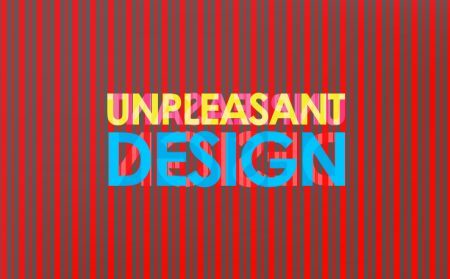 Actually, unpleasant design has been common place for years; we’ve all encountered it in fast food restaurants which have seating that is deliberately uncomfortable to discourage lingering and increase turn-over. Good for the restaurant, not so great for the customer. 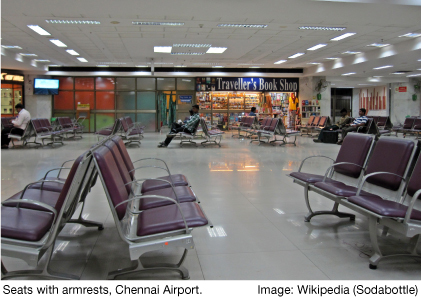 In the context of urban planning, unpleasant design is often found in seating as well. For example, somewhere an urban planner determined that a city bench may only be used for sitting on and woe betide the weary commutator who attempts to lie prone on one. So the designer’s set to work and now many benches in CBD’s as well as in airports and train stations, feature four elbow rests. Often they’re impractically small or uncomfortable to rest your elbow on, but they’re not there for that – they’re to stop anyone from stretching out. And perhaps that’s not such a bad thing - it is annoying when somebody takes the space of four people by lying out full length in a busy departure lounge. Designers and planners have also found ways to design-out far more anti-social behavior, and have been doing so since the 1800’s. Back then the authorities of London began installing urine deflectors around the city. It seems that the owners of residential and commercial properties were less than thrilled with gentlemen who found themselves caught short and stopped to relieve themselves in the nearest doorway or against a wall. To deter this, angled plates were installed which deflected the stream of urine off the wall and back onto the offenders shoes. 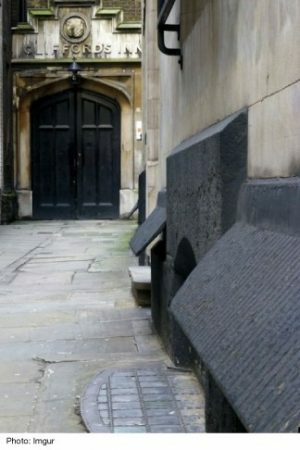 A closer examination of the UK’s older city centers reveal a surprising amount of angled plates and contorted ironwork installed with the purpose of deterring public urination. Another bugbear of city councils is the damage coursed by skateboarders using benches and low walls for grinding (sliding along an object using the edges of a skateboard rather than the wheels). City council’s sometimes fit metal brackets along the edges of seats to stop this. Camden London Borough Council have taken this a significant step further and created what has become known as the ‘perfect anti-object.’ A bench which has been designed to deter sleeping, littering, skateboarding, drug dealing, graffiti and theft by influencing the behavior of the people who use it. The bench is made from concrete, has no crevices in which drugs or rubbish could be stashed, is anti-theft because recesses at the base allow a bag to be stored behind the user’s feet, out of the way of thieves. And it’s odd, rising and falling lines and other strange angles deter skateboarders. It also has a special coating to stop graffiti. 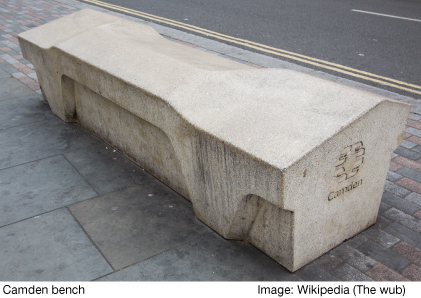 However the Camden London Borough Council have received some criticism following the benches installation in 2012. 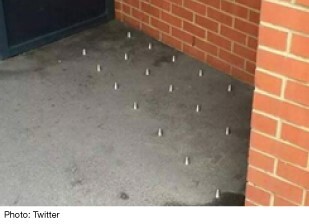 Because they cannot be comfortably slept on, some critics have accused the design of being excessively anti-homeless and hostile to all but the accepted norms of social behavior. Other, less tactile methods of controlling our behavior are also being used. Some businesses play classical music to discourage teenagers from loitering. While that may sound comical, there’s strong evidence to suggest its effectiveness 3 . Even more comical are the pink lights which some UK housing estates have installed in their foyers and hallways. The pink lights exaggerate blemishes on the skin and the theory is that acne-prone teenagers will avoid congregating under them. Blue lighting is commonly used in public bathrooms as it makes it harder for intravenous drug users to find a vain. Other examples of unpleasant design can be found in most public spaces. Hand rails are sometimes painted in a sandpaper lacquer which is extremely unpleasant to touch and discourages climbing. Non-drying oil paint is also used on walls to stop climbers, graffiti and burglars. Some clubs have refrigerated bar surfaces which deter customers from leaning against them for too long and making it difficult for others to get served. One anti-social behavior which Christchurch City Council will be particularly mindful of during the rebuild is vandalism – at least they ought to be, it cost the council just under $800,000 for graffiti removal in the 2014/15 year. Unpleasant design certainly has a part to play in defending city from tagging and other graffiti and many public amenities and buildings take defensive steps against it. The recently built Aranui Community Centre in Christchurch has installed an anti-vandalism drenching system. Sensors around the perimeter of the building detect movement within a certain proximity which then activate concealed water jets which dowse the building and the would-be vandal in water. However the attractive Aranui Community Centre is not an example of unpleasant design. Its harmless high-tech defensive mechanism is no doubt effective, but it is a secondary layer of technology, unlike the Camden Bench, the building is not intrinsically anti-vandalism. Also, the Camden Bench works by deterring anti-social behavior by being hostile. It is so unwelcoming of all interaction except sitting that it effectively forces people to interact with it in a certain way. 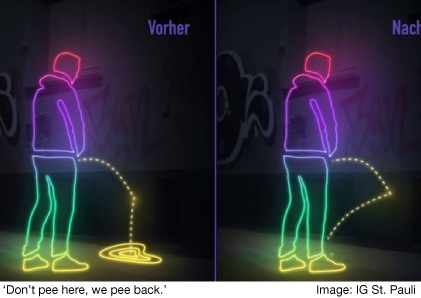 But what if a product could encourage positive social interaction rather than discourage anti-social behavior? One Christchurch manufacture may have found a way to do this. In addition to innovative lighting solutions, Solar Bright have also designed a bench for use in public spaces. 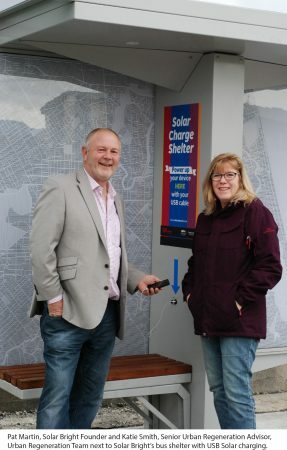 The bench incorporates cordless charging for cell phones powered by Solar Bright’s solar panels. These benches are located in the city center and in the Morehouse Road skate park. When they were installed there was some concern that the benches may suffer from vandalism. However over the years that the benches have been in place they have suffered little or no damage through misuse or abuse. By providing a free, highly desirable service these benches have been accepted by local teens and not just looked after but actively protected. 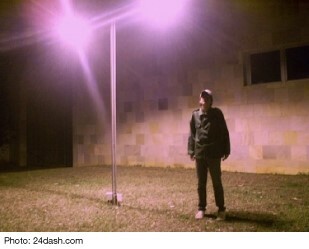 By doing this Solar Bright have created a product which does not need to be protected or policed. The local community values them so highly that they have taken responsibility for them. This represents the opposite of unpleasant design, while achieving much of what unpleasant design and hostile architecture set out to do. Over the next few years architects will continue to shape Christchurch City and, if work to date is anything to go by, we could have one of the most attractive modern cities in the world. However, once the building have been built and the heavy infrastructure is in place, a second wave of amenities and services will be needed. Bus shelters, rubbish bins, benches and tables. They’re not as glamour’s as the iconic building being created by the likes of Warren and Mahoney and Sheppard and Rout but they’re essential and they maybe influencing your behavior without you noticing it, for better or for worse.